On May 10, 1940 German elite troops took the Belgian fortress of Eben Emael by complete surprise in only a few hours. They landed on top of this site with DFS 230-gliders. Unlike paratroopers, a glider force is able to put its load, which can be a team or a vehicle with some men, at a very specific point. Also the US-forces realised a gliderforce should be established. 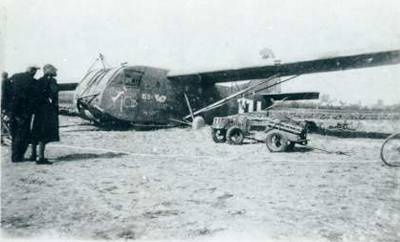 The result was the WACO CG-4A, a glider which was much bigger than the German DFS-230, which was capable to deliver 13 fully equipped soldiers, or a jeep, or a bulldozer all over the world. Also the British used the GC-4A intensively. The plane was used for a wide variety of operations. One was towed over the Atlantic, another landed on a river sandbank in Burma to deliver boats to cross it, Soviet officers were landed behind German lines in the snow of Yugoslavia. But the GC-4A will be remembered as the plane which played a vital role in the invasion of France and Holland. When I was a student, I discovered the remains of this glider near my home in Belgium. With some enthousiasts, we recovered it and started a rebuilding operation. We were able to locate its former pilot, Jim Rike, and do know the whole story of "our" GC-4A. This Website will give some more info on this historical plane, of which more than 13 000 were build. This is an incredible number, only overclassed by the famous aircraft as the Messerschmitt Bf 109, or Focke Wulf. More WACO's were build than B-17 Fortresses. But this plane never received the same attention.